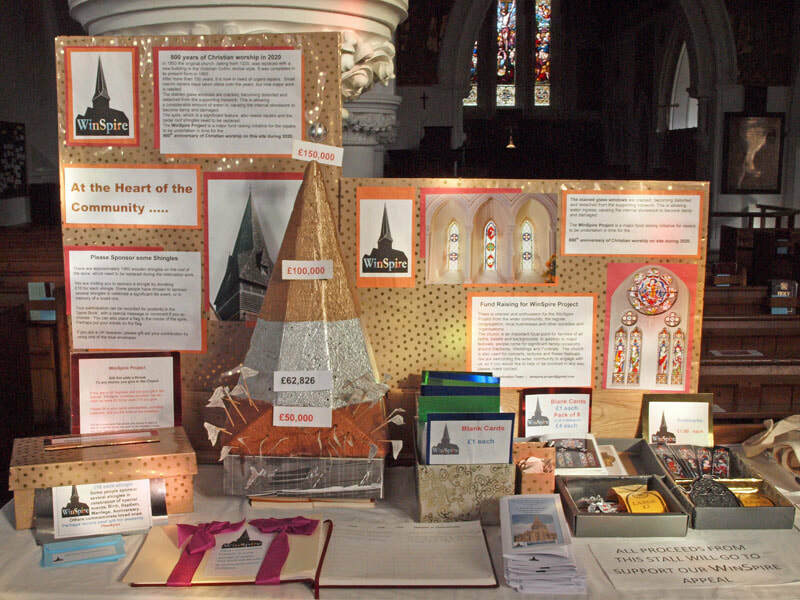 The Winspire project aims to improve the fabric of the building by repairing the windows at its west end, and repairing the spire in time for the 800th anniversary of our foundation in 2020. ​It also wants to put the church back into the centre of Sandhurst by improving community links and reinforcing its 800 years of service to the area. Our fundraising has included several events in aid of Winspire, including the Christmas Tree Festival which attracted interest from the wider community. ​More photos of events can be found here. I am delighted to announce that the major restoration of the St Michael Window is now complete and the window was returned to its place in plenty of time for Christmas. The window now glows in the sunshine and the faces of the saints can clearly be seen again after the careful restoration work by Salisbury Cathedral Stained Glass Workshop. Two smaller windows, also at the west end of the church, are away for restoration and will be returned in February. I want to thank the St Michael’s community for their support in raising the approximately £25,000 it has cost to complete the project. We are now working hard to raise the funds for the repair of the spire, clock and bells, all of which need substantial work if they are to be safeguarded for the future. We are applying for grant funding, but continue to welcome any support that our community can offer. Smith of Derby came to assess the clock in December and told us it needs a complete overhaul and restoration of the face, which is very faded. This will cost approximately £10,000. Derek wrote in the January newsletter about the work needed on the bells. There is also the cost of the spire repair! If anybody would like to make a specific donation toward the repair of a bell or the clock, perhaps in memory of a loved one or for a specific event, please get in touch. At December 2018 we have raised £80,000 out of an overall target of £240,000. ​Please do come and donate at our Winspire stand at the back of the church see picture. You can donate by cash or cheque. Buy a bag or tea towel. You can download the WinSpire leaflet, which includes a donation form, by clicking/tapping below. Please print out the form, fill it in, and send it back by post to the address given, or by e-mail to office@stmichaels-sandhurst.org.uk. ​Many thanks!